Kim Jong Un Joins the Big Leagues in Missile Technology. Game Over? The near three-month hiatus in North Korean strategic weapons tests is now over. Kim Jong Un had maintained a rapid operational tempo of nuclear bomb and ballistic missile tests throughout 2016 and 2017. 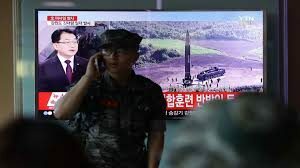 These tests included progressively more powerful and more reliable missiles and North Korea’s first hydrogen bomb (exponentially more destructive than an atomic bomb) on September 3, 2017. Then Kim seemed to go quiet. There were no tests for almost three months, from September 3 to November 28. Analysts speculate on the possible reasons for this. Some said that Kim’s testing capabilities were degraded by the collapse of a tunnel in the main underground testing facilities that killed several hundred workers and technicians. (The tunnel collapse could affect bomb testing, but would not directly impact missile tests). Others said that Kim had to address internal political concerns resulting from sanctions, although there is no evidence that the Kim dynasty has ever cared much about the welfare of their people. Finally, some speculated that Kim was making a show of goodwill toward the U.S. in a search for dialogue and sanctions relief. This was surely wishful thinking since Kim could have had dialogue and sanctions relief years ago without a show of force. The more likely explanation is that Kim did not want to be overly provocative by testing during the Chinese Communist Party Congress in October, and the Trump-Xi summit meeting in Beijing in early November. Now that both of those political events are over, it’s back to business as usual for Kim, as this article shows. Unfortunately, this new missile was not just more of the same. It’s larger and more powerful with greater range than any missile North Korea has tested before. It exhibits a rounded nosecone (instead of a narrow pointed nosecone), which indicates the potential to carry multiple warheads and improves reentry capability. Most threatening of all is that the indicated striking distance of the new missile includes almost all of the continental U.S. and Europe — something Kim has not achieved before. The U.S. has made it clear than Kim will not be allowed to posses a nuclear arsenal that threatens the U.S. Kim is on a path to do exactly that. This makes war likely in a matter of months.